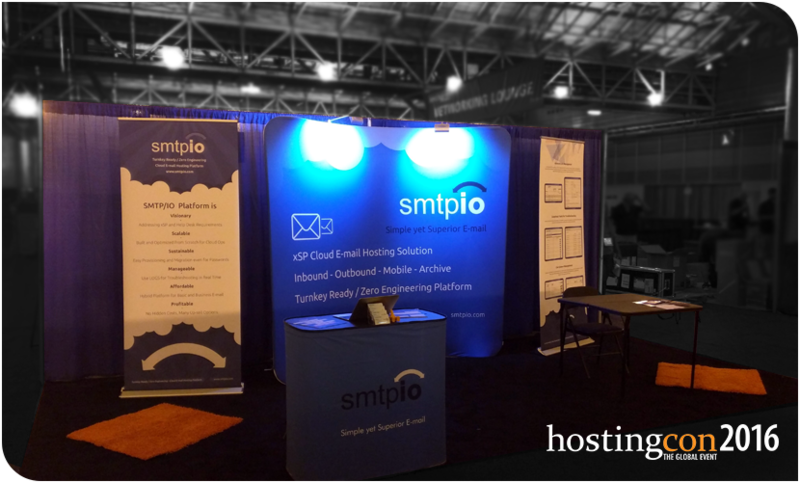 For the third year in a row, SMTP/IO was at HostingCon, this time taking place during July 24-27 2016 at Morial Convention Center, New Orleans, LA. Every year, HostingCon allows us to get together with the Hosting and Service Provider Community, meet with current and prospect partners, introduce new features, and get invaluable feedback. This year was no exception. We met with a lot of people, had great time and came back rejuvenated. During our time at HostingCon, once again we saw that E-mail continues to be a pain point for Service Providers. They have a very hard time competing with companies such as Microsoft and Google, yet they feel obligated to offer an E-mail solution which takes enormous resources and is not profitable. Some of our partners call it “the necessary evil”. SMTP/IO offers a complete end-to-end E-mail Hosting Platform either on the cloud or on premise, but now we also offer parts of this platform to ease those pain points right away, without any commitment or added cost. Incoming and outgoing transport services allow Service Providers to see what their network generates in terms of E-mail traffic, let anomaly detection features automatically plug holes and simply take back control. Than the rest of the platform with features like Zimbra mailboxes, archiving and mobile sync allows our partners to up-sell an E-mail service that is able to stand on its own against the best and become a profitable service. SMTP/IO will continue to work with only Service Provider partners and will never work directly with end users. Our name is derived from an Internet protocol and is not very friendly because the only name recognition we strive for is from the tech savvy Service Provider industry. We hope to see our partners on other Hosting and Service Provider Industry events.